Not long ago my husband and I went on a long weekend getaway to a cottage in Wisconsin on Lake Koshkonong. We we’re both looking forward to a fun and relaxing time and also doing some fishing, which we both enjoy. As our trip neared I kept envisioning the fish we’d catch and bring back to the cottage and fry up for dinner. 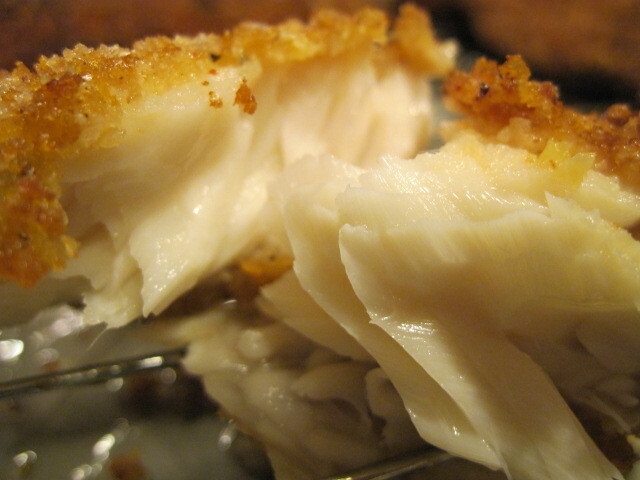 Seriously, what could be better then fresh caught fish? Well, guess what? Not a bite to be had! At all! Those darned fish totally outsmarted us and all we were left holding, was the bait! In our defense, however, even though we had been well into autumn for several weeks, this particular weekend found our temperatures well into the upper 80’s and from what I understand, fish don’t usually bite in such conditions. So much for my visions of pulling fish after fish out of the water. Too bad, so sad for us. I guess our fish fry would just have to wait. Fast forward to now. My cravings didn’t go away when we got back home and last night I once again had a-hankerin’ for a fried fish dinner. It surely wouldn’t be the same as hooking our own dinner on the line but I’d happily wait in line to purchase some tasty looking Tilapia at our local Costco. They were beautiful fillets; large, plump and meaty. 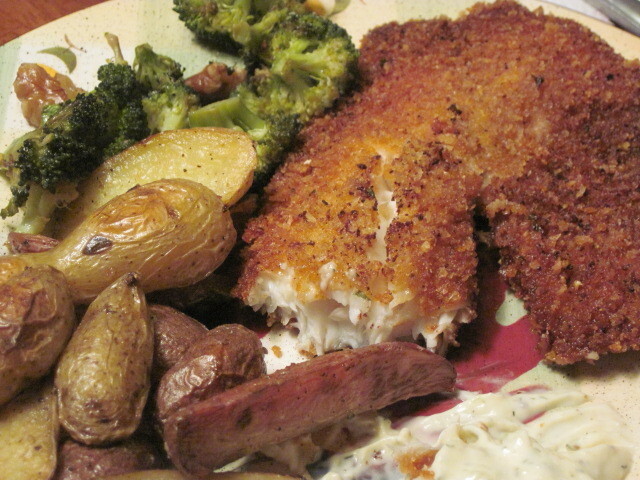 We couldn’t have done better had we caught them ourselves 🙂 Here’s the recipe I came up with for making the best tasting Friday night fish fry, EVER! If you don’t believe me, try for yourself. 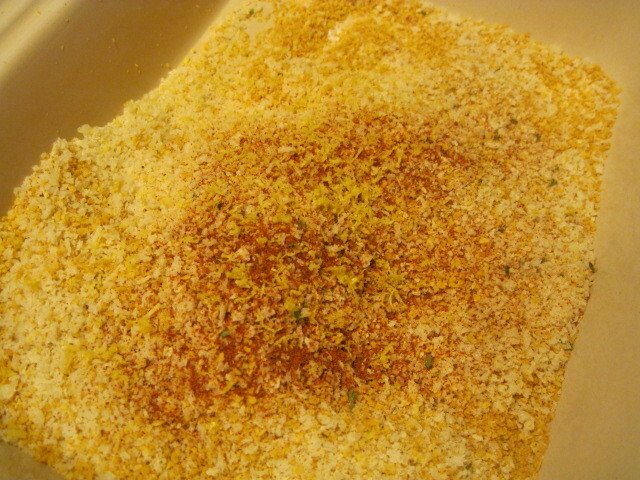 -Combine all the dry ingredients together in a shallow pan and mix well. 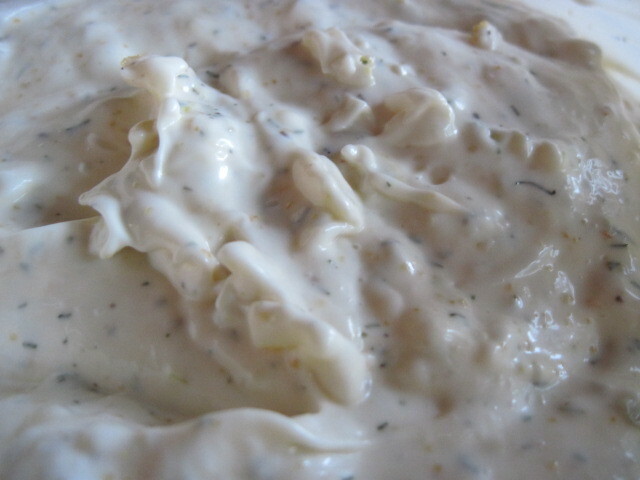 -Dip each fillet into the buttermilk and then into the coating mixture. -Press the coating firmly onto the fish fillet making sure to completely cover both sides. 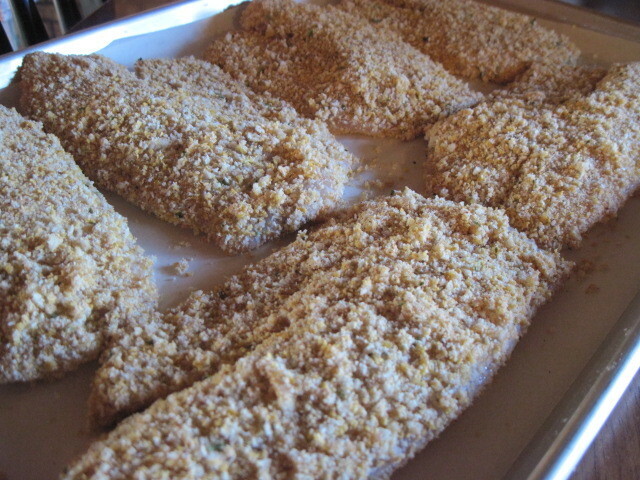 -Continue with each fillet until each is completely coated with the crumb mixture. -Place the fish into the refrigerator for at least one hour in order to completely adhere the coating to the fish before frying. -In a large high sided skillet or Dutch oven, heat 2-3 inches of canola oil to 375 degrees. *Note – A good way to test your oil if you don’t have a thermometer is to place the handle of a wooden spoon in the oil and if constant, rapid small bubbles form around the spoon, you’re good to go. 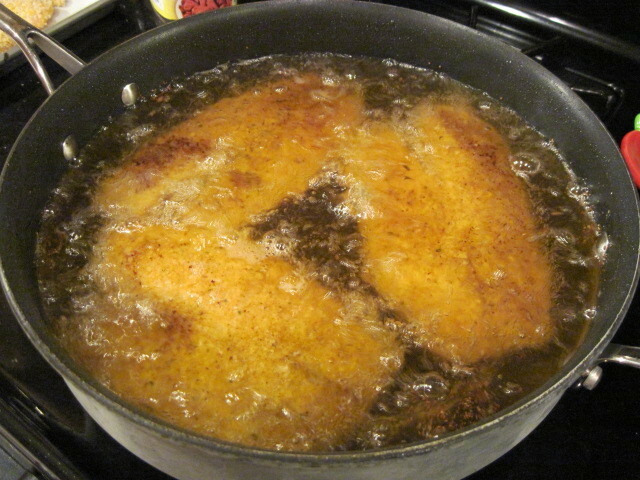 -Add the fillets to the pan 2 or three at a time and fry for approximately 3 or 4 minutes each or until they’re a deep, golden color. -Remove from oil and drain on paper towels. Keep them warm on a baking rack in the low oven while you cook up the remainder of your fillets. Now while I wouldn’t recommend eating this way every week, on occasion you really needn’t feel bad about splurging on this type of dinner if you’ve got a hankerin’ as I did. 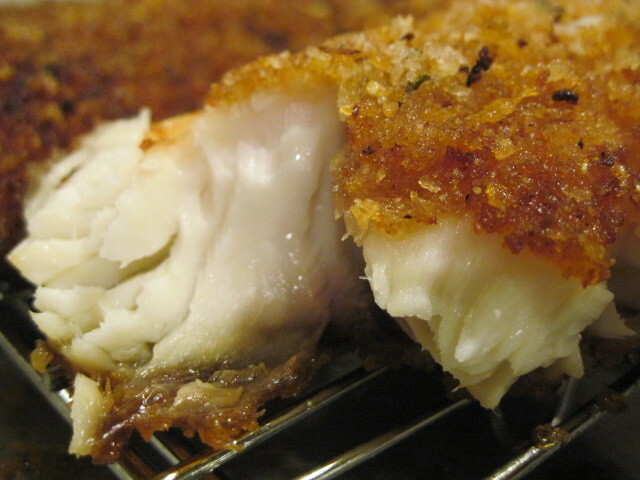 This meal goes best with good friends so we invited some over and we all enjoyed the wonderfully flaky, deliciously moist, super crisp and delicate taste of this delicious Friday night fish fry. To round out the meal, I also served roasted fingerling potatoes with roasted broccoli and walnuts. See, healthy is never far behind. After dinner, we all headed out to the back yard for an evening of sitting by the bonfire, roasting marshmallows and playing funny word games. Now that’s what I call a wonderful getaway, without ever having to leave home. I can't eat fish of any kind but my husband loves it. 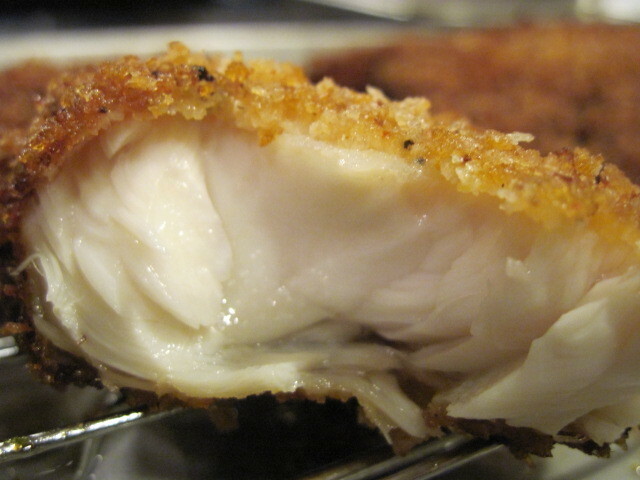 Your breading and your tarter sauce look lovely and I'm sure I'll fry this up for him sometime. Thanks for posting. 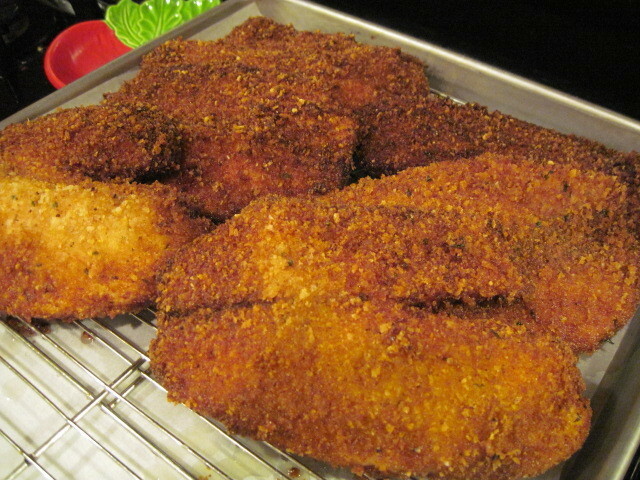 A Wisconsin fish fry can't beat the wonderful breading, moist fish, and tasty sides that you created Friday evening! Letting us share that experience with you will be a fond memory, as always. You put in a lot of work and love into that meal and we can only thank you and Mark for a really enjoyable evening. Sorry it ended so late. I love fish frys.This by far was the best one!Good food,good friends,and the perfect setting.Ever night should be a Renee's fish fry! This looks absolutely delicious! Thanks for sharing! Sorry you didn't get to catch any fresh fish but at least you made do with what you had right?? WOW! You know how to do fish… RIGHT! Looks delicious! Love the ghost in your next post too! Thank you all for taking the time to stop by and leave your comments here. Glad you liked this post and recipe. Believe me, it's been on my mind since we ate it last Friday night 🙂 Unfortunately, I'll be waiting for at least a few months before I do a fry fish again. All things in moderation, right? Damn! That's some fine looking fish fry! Hungry… Stumbled!